Reducing portfolio risk is often one of an investor’s greatest concerns. Diversifying your assets allows you to reduce your investment risk while often providing a higher return. Diversification means simply not owning enough of any one asset to make a killing at it or to get killed by it. Choosing numerous asset classes that fluctuate independently of each other (one may zig while another zags) can reduce the volatility of your overall portfolio. You can not only avoid those sleepless nights, but also put more money in your pocket at retirement time. 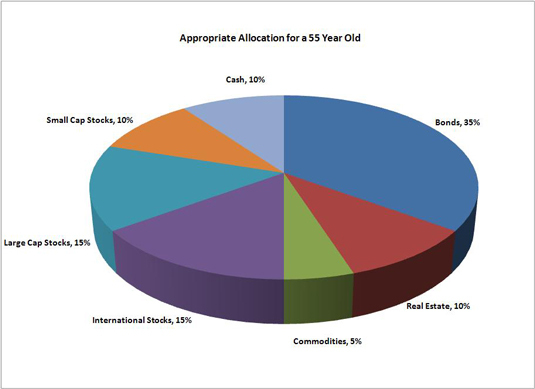 Just how much of each of these asset classes is appropriate for your portfolio depends on your age and risk tolerance. 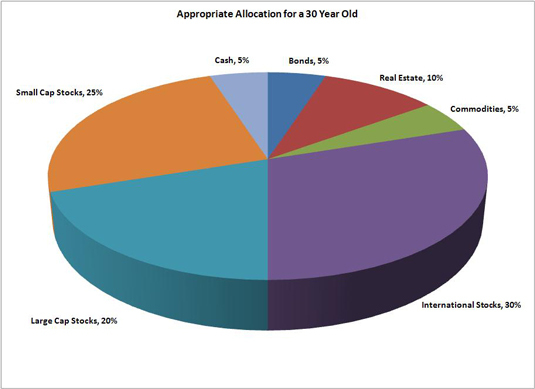 If you are young, comfortable with market fluctuations, and have ten or more years until you need the money, you would want the majority of your portfolio to consist of stocks with only a small portion of each of the remaining asset classes. If you are an investor on the verge of retirement with a moderate to low risk tolerance, you would be better suited with a portfolio balanced between stocks and bonds and a small percentage of each of the remaining asset classes. Each of these asset classes can be invested in via your 401k, IRA, or company-sponsored plan, depending on the investment choices offered by your particular plan. If you would like to invest outside of a company sponsored retirement account, your best options are either index mutual funds or, ideally, ETFs (Exchange Traded Funds). No matter what your allocation is, keep your expenses low to increase your return. The higher the expenses, traditionally, the worse the performance. Finally, don’t forget to rebalance regularly. Rebalancing is the act of moving your portfolio back to the original allocation. If you originally wanted to be 50% stocks and 50% bonds, what would happen if the stock market increased 20% and your bonds did not change in value? The portfolio would now be almost 55% stocks and only 45% bonds — very different from your original allocation. Sell 5% of your stocks and purchase back 5% of your bonds. This accomplishes two things, it keeps the risk of your portfolio where it should be, and it allows you to regularly sell something that has done well and buy something that has done poorly. Buy low and sell high, what a concept! Rebalance at least once a year to help improve your overall return and reduce your risk.